Viewers used to watch TV shows with a kind of wide-eyed naiveté, eager to experience each new episode with a fresh perspective. But thanks to pre-air reviews and an obsession with spoilers, that age of viewer innocence is over. 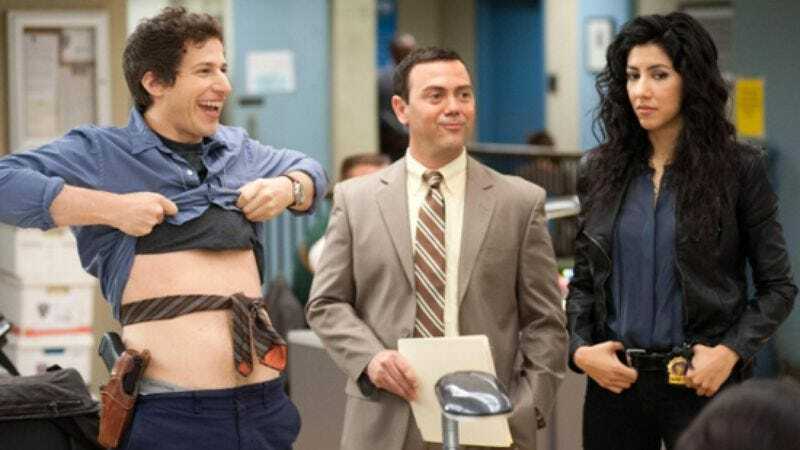 As such, Entertainment Weekly sat down with Brooklyn Nine-Nine’s executive producer Dan Goor and star Andy Samberg to get the inside scoop on what to expect ahead of the show’s season two premiere this Sunday. For those who prefer not to have their TV watching experience unfold in real time, we’ve collected some highlights below. Goor also explain that Amy and Jake’s relationship will be a big part of the season, and while it may not get a resolution, he hopes it is “more complicated and real-world” than the usual will-they-won’t-they sitcom romances. According to Samberg, Jake “takes a beating” when it comes to his love life. “There’s a lot testing his resolve, physically and emotionally. We’ve been sore the last couple of weeks,” he says.